OWGRA has existed as a Residents Association for quite some time but really came to life due to proposals to build on substantial parts of what we think of now as Osterley Park. The estate and house have existed since the 1570s and have gone through various owners, before passing into the ownership of the Jersey family (at the time the 5th Earl of Jersey) circa 1800. It remained a private estate and house until the 9th Earl of Jersey opened it to the public in 1939. After the Second World War the Earl approached Middlesex County Council, who had shown interest in purchasing the house before the war, though nothing eventually came of these discussions. The Earl also tried marketing the outer land for commercial purposes and offering Osterley Park and House to the National Trust (NT). At this time the land was not protected. 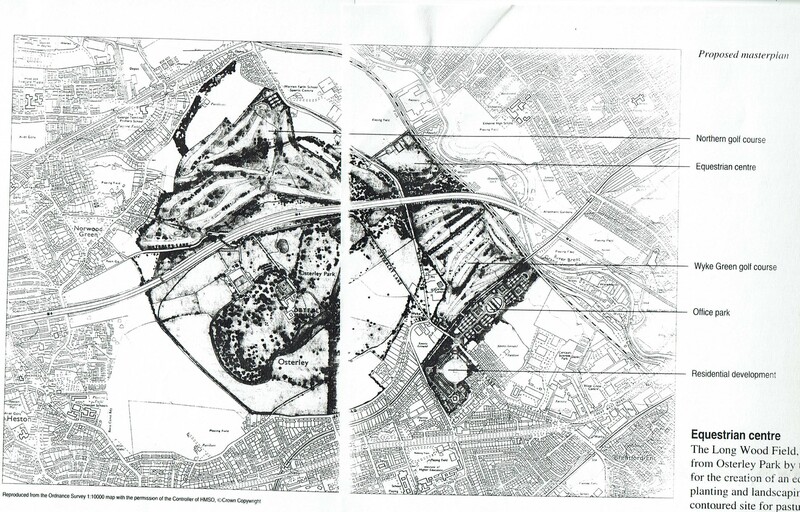 In 1985, a major proposal was submitted by Wates, A major UK housing developer, for a very substantial housing development on large areas of open land, farmland and sports areas adjoining Osterley Park. This development would have had a truly dramatic impact on the area and would have changed the area completely. It would have involved the construction of a huge number of new houses in the area and concreting over almost all the open space in the area, greatly increasing the population, traffic, noise, demand for services, etc. In short, what we think of as the Osterley area would have been lost for ever. We worked with other residents associations in the neighbourhood in a federation called OPAG (Osterley Park Action Group), which consisted of OWGRA plus 10 other Residents Associations. The Wates application was eventually withdrawn, once the scale of the opposition to the proposal became clear. Wates did get consent for the Wyke Estate (c 1980s), and built an estate of 90 houses and 89 flats on the grounds of the old Wyke House. The GLA and LBH also declared the park and surrounding farm land and open space as we know it today to be Metropolitan Open Land. This was a great reward for the efforts of OPAG and OWGRA. We thought that was that, until in 1991 MEPC, a major UK property developer, surfaced with their own planning application, over a similar area of land. This one was constructed to appear less threatening to the character of the area, claiming that its objectives were to “…. Protect the Park by clear re-definition of its boundary and transition between open land and suburban development”. A housing estate on the sports fields between Wood Lane and Syon Lane (now occupied by the Nishkam School and Grasshoppers RFC). 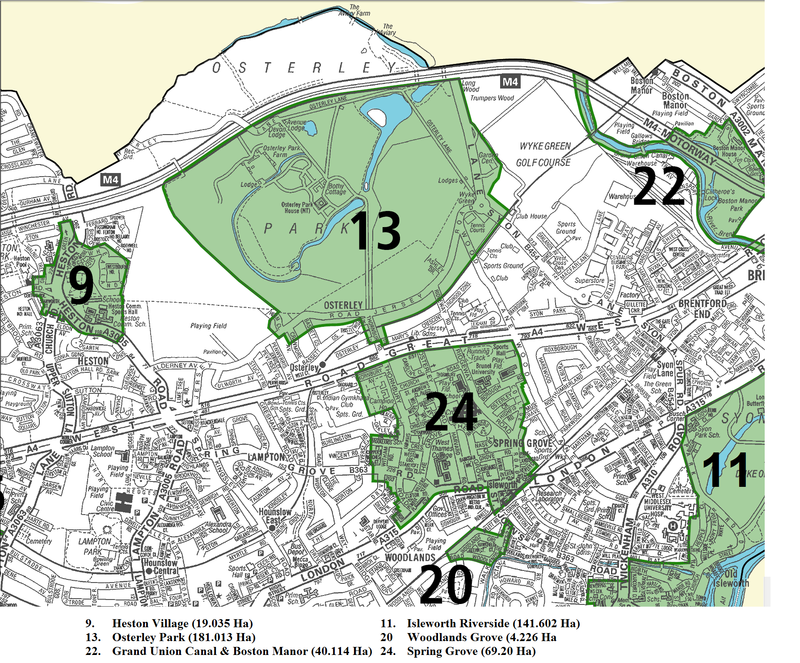 The net result would have been to very substantially reduce the amount of open space in the area, and substantially change the nature of Osterley. It also involved taking a very substantial part of the newly classified MOL and making it private land (golf course, equestrian centre, etc.) which would not be open to the public. This can be seen in the attached diagram from the proposal (which had the imaginative title “An Approach to Osterley”). Plus it risked setting a very dangerous precedent regarding what development would be permitted to happen. Again we mobilized to oppose this, working with other Residents Associations via the OPAG grouping. After 9 months this application was again dropped and we breathed a sigh of relief. But, as they say, things in life always come in threes. In August 1992 The Jersey Trust, acting through Juant Investments and O.J Le Mottee Ltd, submitted yet another planning application. (The Jersey Trust is a mechanism through which the Earl of Jersey manages family-owned assets such as land). This one didn’t bother with trying to appear as if it was making Osterley a better place. 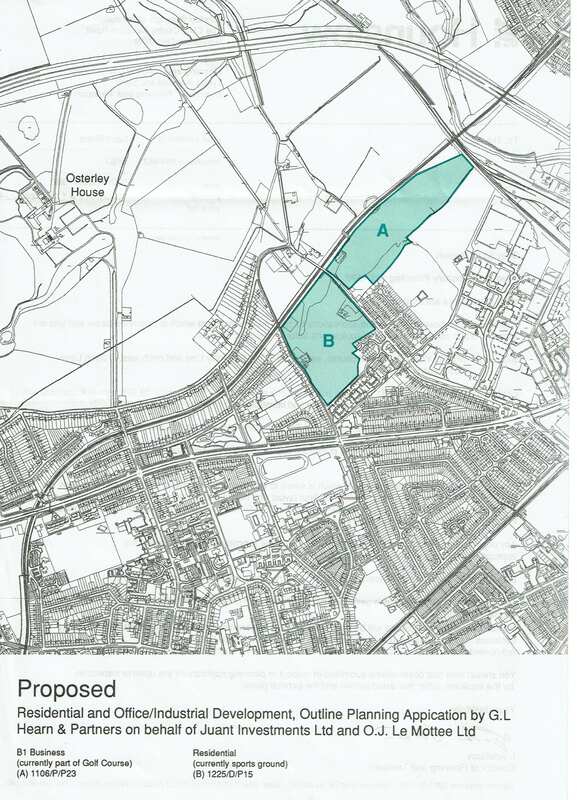 It simply proposed an Office Park on a large part of Wyke Green Golf Club and a Housing Estate on the sports fields between Wood Lane and Syon Lane (see attached). After yet another battle this application was also rejected. The core of all these planning applications (and our opposition to them) was that they proposed to build on Metropolitan Open Land (MOL). This is the open land we see all around us, which gives Osterley its character (Osterley Park, Jersey Gardens, the various sports clubs in the area, etc.). Why MOL is so important is described in more detail in the Appendix below. This showed us that we needed to be organised to remain vigilant to protect our area, and OWGRA has been doing that since then. Tesco. This used to be the site of the historic McFarlane & Lang Imperial Biscuit Works, which actually pre-dated the Gillette Building. The concerns here related to the increase in traffic volume and noise for local residents, which unfortunately proved to be the case. We then were involved in a number of occasions to manage the impact of its operations on local residents (e.g. 24-hour trading). Thankfully we have now developed a good working relationship with Tesco management and work with them to address residents’ concerns (the most recent of which related to Anti-Social Behaviour within the car park, which is now much reduced). Goals. Development of sports complexes such as these close to local houses always involves a delicate balance between running the complex to maximise utilization for the sports, and minimizing the adverse impact on residents living near to the complex. Sky. Sky’s campus has grown dramatically in recent years and we have been involved whenever any of these developments might impact local residents. Given the location of the site, most of this development has been largely hidden from view. The main impact seen has been on increased traffic, pedestrian traffic (e.g. at Syon Lane station) and parking demand. Campion (2006-2010) House, a development of 100 houses (Marbaix Gardens) plus conversion of Campion House and Tigar Hall to flats. Aplin Way and Deborah Close (c 1980) 75 houses and flats. These were mostly built on the sites of former ‘Davies’ houses with large gardens or land released by the Jesuits who had land holdings in Osterley. A residents’ group called Campion Concerns was set up to oppose the campion development. The group worked with the support of OWGRA for five years to reduce the scale of the development and (after four applications and two public inquiries) were eventually successful in protecting what the Inspector for the first inquiry called a “particularly sensitive” part of the Osterley and Spring Grove Conservation Area. One of the continual challenges of all Residents Associations is finding volunteers to help run them. Until about 2010 the Northumberland Estate Residents’ Association looked after the interests of that area, when it merged into OWGRA to allow resources to be shared. This is the reason for OWGRA covering the area it does today, over 90% of the Osterley and Spring Grove Ward. 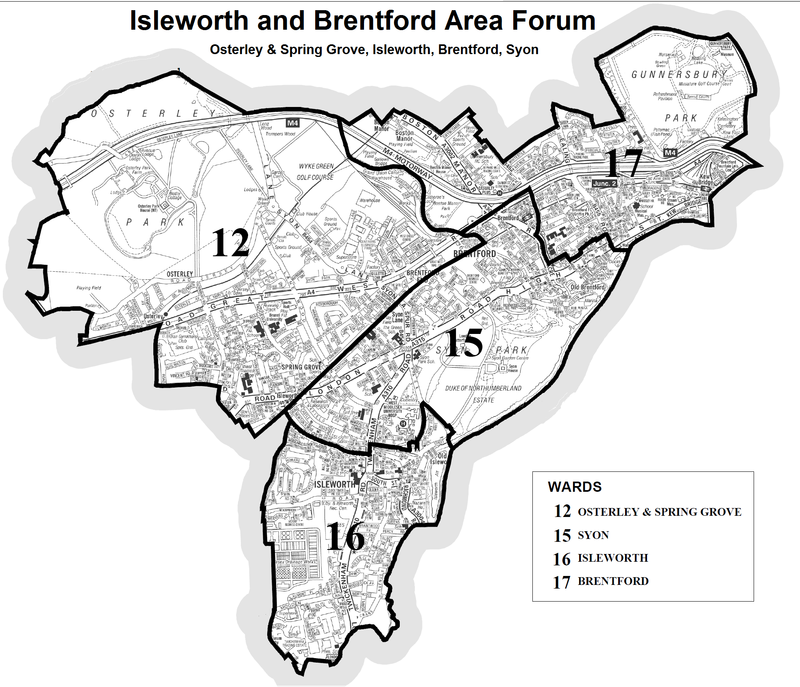 There are also some streets in the Ward (Burlington Road, Eversley Crescent, Spencer Road and Spring Grove Road) which fall within the Spring Grove Residents Association, which straddles our Ward as well as parts of Hounslow Central Ward. During this period OWGRA continued to operate on behalf of residents, with its activities reflecting the reduced size and scale of developments in the area, with as a result its activities being less visible to local residents. This all changed in late 2014 when news of the impending development of the Nishkam school leaked out. A group of concerned local residents formed an action group (Keep Osterley Green – KOG) and launched a spirited campaign to oppose this application, with support from OWGRA. This campaign lasted until September 2016 when they were forced to admit defeat in the face of the united opposition from Central Government, the Mayor of London, London Borough of Hounslow, the Education Funding Agency (a government agency) and a host of other supporters of the scheme (including a fake Member of the House of Lords, a mythical Residents Association that supposedly supported the development, and claims, leaflets and documentation from the other side that used a unique definition of the word “facts”). KOG was able, with support from OWGRA, to substantially extend the planning process, impose a high level of critical focus on the process (including good coverage in local and national press) and go all the way to having a Judicial Review of the decision in the space of the 23 month-long campaign. The campaign reinforced the critical importance of protecting all the Metropolitan Open Land in our area from development. This has been (grudgingly) acknowledged by LBH, and is being reflected in their long-term planning (which then guides all development). This does not mean that all the MOL is safe; but LBH know they will face a hard fight if any development is planned on any MOL in our area. The opposition to this development substantially delayed it and markedly increased the costs and effort required by the other side to push it through (with the start of construction delayed by over a year). This has been noted by the powers that be – in short, our voice has been heard. We have heard comments from senior figures to the effect of “we don’t want to try that again”. But peoples’ memories can be short and with the constant pressure to develop we know we have to remain vigilant. Since then we have seen a very marked improvement in the robustness with which planning policies are enforced on developers, and a very welcome improvement in our working relationship with the planning bodies and developers. Indeed, on two recent major planning applications the developers pro-actively reached out to us to seek to tailor their application in line with local residents’ views. This is a seismic shift from the approach used previously by developers. We have no way of knowing whether this was due to anything KOG and/or OWGRA did or whether this would have happened anyway; but it is nevertheless welcome. It does however mean that OWGRA is finding its views on proposed developments more closely aligned with developers and LBH Planning than has been the case in the past. We have established Osterley & Wyke Green as an area where local residents care passionately about their area and do not welcome developers foisting anything they want on us. We hope that this will result in developers being more careful when considering any significant development in our area. In short, we have to remain vigilant; it is unlikely there will not be more attempts in future to develop on the MOL land in our area – but for now it looks safe. And what happened to the KOG team ? 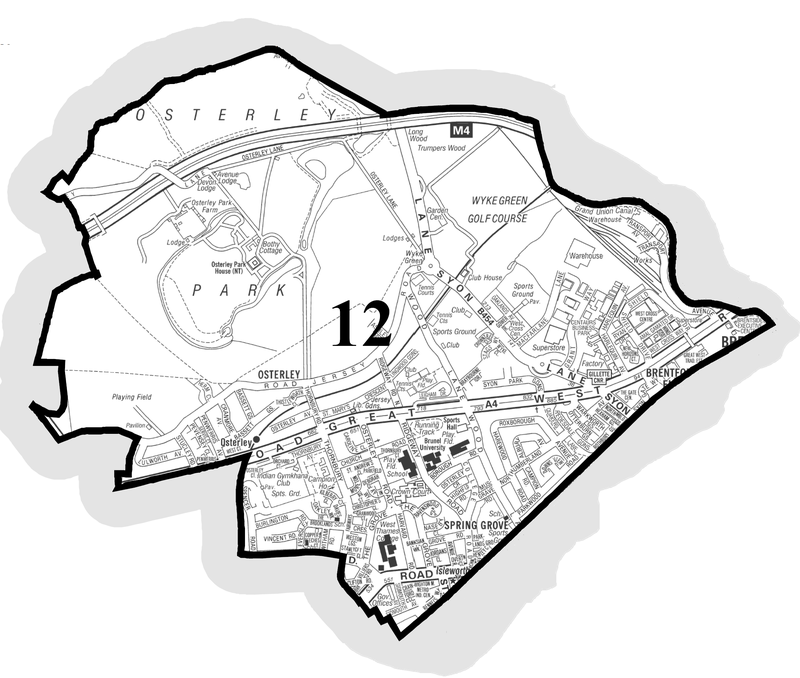 The Keep Osterley Green campaign was a single-issue campaign driven by a highly energetic and motivated team. Once this campaign had finished, the team decided that they wanted to continue working together for the good of the area. As a result they merged the campaign into the OWGRA organization, and joined the OWGRA Management committee. OWGRA, revitalized by the new committee members, continue to work to maintain everything that is good about our area, as can be seen elsewhere on this website. Much of the open space that Londoners currently enjoy owes its existence to the activities of the London County Council (LCC) established in 1888, and its predecessor, the Metropolitan Board of Works, which saved thousands of acres of parks, squares and common land as public open space. The Greater London Regional Planning Committee first considered the need for a ‘green girdle’ around London to restrict urban sprawl and safeguard land for recreation in 1927. In 1931 the Municipal Reform Scheme proposed a Green Belt ring of open space which led to the LCC contributing to the purchase and preservation of open space by local authorities around the capital. The Green Belt (London and Home Counties) Act 1938 strengthened the powers of local authorities and parish councils to acquire land and impose restrictive covenants on users. The concept of Metropolitan Open Land (MOL) is more recent than that of Green Belt but it has a similar status in planning terms. MOL is a designation unique to Greater London. Its purpose is to protect strategically important open spaces of London-wide significance within the built environment. These are spaces that contribute to the capital’s green character, provide recreation facilities for Londoners and often preserve landscapes of historic or biodiversity value. In 1969 the draft Greater London Development Plan (GLDP) was published by the Greater London Council (GLC) which succeeded the LCC in 1963. MOL was introduced in the GLDP, which was finally approved in 1976, as a protective designation for strategically important open land within the urban area which helped shape development and distinctive communities and provided recreational opportunities. It was recommended that parks, woodlands, golf courses, nursery gardens, cemeteries and other open land which might otherwise be at risk of development should receive this designation. In 1989 the Government accepted that the same presumption against development in the Green Belt should apply to MOL as well. This protection was then given legal backing in the Town and Country Planning Act 1990 (which replaced the ‘original’ Planning Act of 1947 though there were lots of others in between, regarded as ‘patches’) giving the GLA and London Boroughs powers to designate MOL within their areas which were not already green belt. Prior to this there was no real legal protection for such land even if designated as such. The designation of land as MOL means that it is supposed to have the same level of protection from development as Green Belt, with some limited development permitted for sports use. It is intended to be protected in perpetuity for future generations. The level is high, but unfortunately not absolute, and developers can always try to argue that “very special circumstances” justify their incursion. Opposing such arguments can be very challenging.